As many of you know, my “Word” of the year begins in August after I travel to Vista, California. My word journey began by “accident” as far as I knew. So this is my 7th year to choose a guiding word…. or should I say the word chooses me! The past two years, unlike the previous five, I have had a word in mind before I arrived in Vista. I had been talking to God for several weeks about this year’s word since I had a preconceived notion of what it might be. I asked God to make the “right word” really clear for me so that his direction would trump my own. As usual, I called my friend, Joy in Vista a few weeks in advance of my arrival. You see, it is at Joy’s booth at the Vista Farmer’s Market where I retrieve my word. When I called Joy to secure our annual Saturday connection, her response left me silent for moments… Joy’s news was devastating to me. She was not going to be at the market! I thought, WHAT?? How could it be? WOULD I HAVE HAVE TO GO WORDLESS? Joy stepped into the silence (though the panic in my mind was loud and clear) with what she expected would be reassuring words. “Not to worry. I have already put your word aside for you. I feel strongly about this word for you.” EXCUSE ME?, I thought. How could you possibly know what word to choose? This journey is personal between me and God! Then, I remembered my prayer. “God please make it really clear.” Could it be that he has lead Joy to choose my word? It was time for another prayer. “Ok, God. if Joy has not chosen the right word for me, then please make the word clear in the other soap word selections at Vista. I felt good about that. There is a back up plan. Joy and I agreed, I would go to her booth at Vista to pick up my word even though she would not be there. It was all good… because I had a back up plan. After all, remember, this word is an ALL YEAR deal. My husband and I traveled to Vista. Reunited with our friends Andrea and Neal. We caught up on the past 365 days with lots of love and laughter. Then, on Saturday we ventured out on our annual pilgrimage to the Vista Farmer’s Market. I was hopeful that the word that Joy had chosen would be reinforced when I saw all the other choices. I found my way to Joy’s booth manned by someone I had never met before. I looked for the “word / intentions soaps”. My casual search turned into a bit of a frenzy. I approached the unfamiliar sales person and asked where the intention soaps were. She informed me that Joy did not carry those soaps at this market any more. WHAT? No soaps to review? There goes my plan B! I asked this person for the package Joy left for me. She knew nothing about it. Again, I thought, would this be a “Wordless Year?” We soon discovered the package (which she had innocently mistaken as a gift for her). I opened the bag. There was my word. It was NOT the one I had in mind. Why was I fighting the word? Why should it be a hard one to receive. I should be wide open embracing it. The word was LOVE. The word I had secretly hoped for was JOY. Funny. Not only was joy not the word – but JOY herself was not present in person this year for the very first time in seven years. God is funny and should I add… clear. Now that I am several months into living my new word, I am realizing that love is not just about others. It is also about loving myself – like God does – unconditionally, with grace and with mercy. That sounds like it should be easy. Is it easy for you? I am learning to love the me I am today with all my flaws and imperfections. 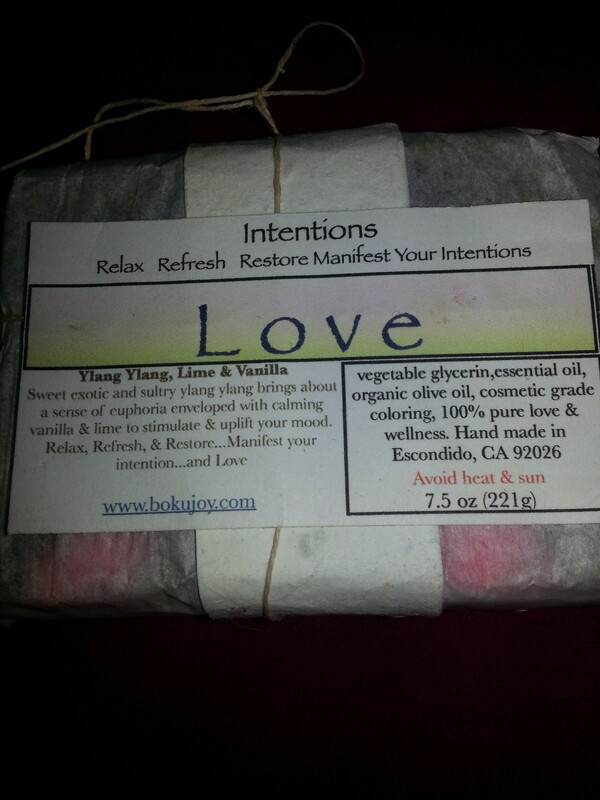 I am surrounding myself with reminders of love – with Joy’s LOVE candle, LOVE soap. I have a LOVE plaque over a doorway in our home and so on. Most of all, I have a red cross that is next to my reading chair. It reminds me every single day how much I am deeply loved no matter what. It means the same for you. It is my honor to send you LOVE today, my friends! How do you surround yourself with reminders of love?